You will find below the horoscope of Alison Elliott with her interactive chart, an excerpt of her astrological portrait and her planetary dominants. If you know the time of birth of Alison Elliott, we would appreciate it if you would send us your information with your source, at stars@astrotheme.com. To thank you for contributing to the enhancement of our astrological database, we shall be glad to send you the astrological portrait (34 pages) of this celebrity. Horoscopes having the same aspect Mercury conjunction Saturn (orb 0°50'): Albert Einstein, Harry Styles, Julie Gayet, Nelson Mandela, Naomi Campbell, Edgar Cayce, Mark Wahlberg, Michelle Williams, Alanis Morissette, Buster Keaton, Tina Fey, Neymar... Find all the celebrities having this aspect. Horoscopes having the same aspect Sun opposite Neptune (orb 1°11'): Elizabeth Taylor, Chris Evans (actor), Adriana Lima, Naomi Campbell, Brigitte Macron, Johnny Cash, Steven Seagal, Laure Sainclair, Jean-François Copé, Madhuri Dixit, Jean-Louis Borloo, Agnetha Faltskog... Find all the celebrities having this aspect. Celebrities clicked on in real-time: 576,402,951 times. Alison A. Elliott (born 19 May 1970) is an American actress. Elliott was born in San Francisco, CA, the daughter of Barbara, a teacher of nursing, and Bob Elliott, a computer executive. She moved with her family to Tokyo, Japan when she was 4 years old, and then moved back to San Francisco when she was 8, where she later attended an arts high school. At 14, her modeling career began, and in 1989, she moved to Los Angeles to star as a teen-aged model on the TV sitcom Living Dolls (1989). She is perhaps best known for her roles in films, such as Underneath (1994), The Spitfire Grill (1996), The Wings of the Dove (1997), and Birth (2004). Here are some character traits from Alison Elliott's birth chart. This description is far from being comprehensive but it can shed light on his/her personality, which is still interesting for professional astrologers or astrology lovers. 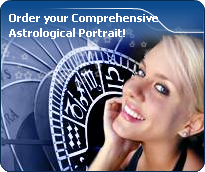 In a matter of minutes, you can get at your email address your astrological portrait (approximately 32 pages), a much more comprehensive report than this portrait of Alison Elliott. Warning: when the birth time is unknown, which is the case for Alison Elliott, a few paragraphs become irrelevant; distributions in hemispheres and quadrants are meaningless, so are dominant houses and houses' accentuations. Therefore, some chapters are removed from this part. Like the majority of Earth signs, Alison Elliott, you are efficient, concrete and not too emotional. What matters to you is what you see: you judge the tree by its fruits. Your ideas keep changing, words disappear, but actions and their consequences are visible and remain. Express your sensitivity, even if it means revealing your vulnerability. Emotions, energy and communication must not be neglected; concrete action is meaningless if it is not justified by your heart, your intellect or your enthusiasm. Cheers for communication and mobility, Alison Elliott! The predominance of Air signs in your chart favours and amplifies your taste for relations and for all kinds of short trips, whether real (travels) or symbolic (new ideas, mind speculations). You gain in flexibility and adaptability what you lose in self-assertion or in pragmatism. The three most important planets in your chart are Venus, Pluto and the Sun. After this paragraph about dominant planets, of Alison Elliott, here are the character traits that you must read more carefully than the previous texts since they are very specific: the texts about dominant planets only give background information about the personality and remain quite general: they emphasize or, on the contrary, mitigate different particularities or facets of a personality. A human being is a complex whole and only bodies of texts can attempt to successfully figure out all the finer points. Your mind is calm and balanced; even though you assimilate slowly, your memory is remarkable. Your judgment is based on reflection and reason and draws on past experiences. Alison Elliott, you are a good adviser, a reliable person whom people can confide in discreetly. You are full of good sense, cautious, methodical and disciplined and you are able to carry many good projects to a successful conclusion. You are very opinionated and determined in your actions. However, your tendency for intolerance and prejudices may offend your entourage. They wish that you exercised more flexibility instead of systematically refusing what cannot be immediately checked. You usually express yourself with a lot of charm and this is what allows you to get people to better accept your well-established habits. What is it, that really appeals to you, Alison Elliott, to love or to please? You have so much charm and so much volubility that you easily manage to be what is known as a femme fatale. Feelings and intellect are so tightly mingled that you may not know any more whether you are really in love or whether you are acting. You have a taste for flirt and variety, and you appreciate very much complicated situations where no one knows where the truth lies any more. You shift from one game to another. To you, everything can be an agent for seduction, be it your attitudes, your words or the way you dress. You do not separate your actions from your desire to please. People who do not understand this are in trouble because, if they take your sweet and well-phrased speeches too literally, they are likely to undergo cruel disappointments: for you, it is only a matter of living in the moment and you never commit yourself because, above all, you loathe confinement, even just its thought. Alison Elliott, your mental activity is exuberant. Ideas are buzzing at high speed and you have the ability to think of several different things and to simultaneously process them. You are less interested in actions on the concrete or physical plane, because once you “see” a solution, its implementation is not that important any more since the crucial thing is that your mind remains bubbling with excitement. You are cerebral and curious and your sexuality is filled with fantasies, where pleasant ideas are mixed up with amplifying and enriching desires. Therefore, you are not simple but if your partner follows you, the stake is really worth it. Verbal jousting, the pleasure to debate and to discuss are continuous, with you. The only danger is to irritate people who may not have your swiftness or your sense of humour. This text is only an excerpt from of Alison Elliott's portrait. We hope that it will arouse your curiosity, and that it will prompt you to deepen your knowledge of astrology, as well as to visit and use the wide range of free applications at www.astrotheme.com. Your Life Path is influenced by the number 5, Alison, which indicates changing and off the beaten track destinies. Your activities are varied and placed under the sign of adaptability, and multiplication of resources. More than anyone else, you need to enhance your learning capacities and the broad-mindedness. You must cope as well as you can with changes and transformation occurring in your life. Indeed, Life Path 5 brings about destinies which are prone to twists and turns, as well as to upheavals. Therefore, your life's main orientation may vary considerably at certain stages, and if your destiny is that of adventurers whose course is fraught with obstacles, it may also turn you into an exceedingly unstable person through lack of nuance. You accumulate experiences and enrich your know-how with each crucial period. Your adaptation skills enable you to go through all the successive stages of your life without ever being destabilised by new situations.